This is our last day on the Island. We did some shopping at the Newfoundland Costco where prices seemed to be 50% to 100% higher than on the mainland. The only bargains were the iPods which sell for the same price in Canadian $ as US$. Our next stop was the Railway Coastal Museum. It does a good job of explaining how the railway got started (to develop the interior) and why it no longer exists (lost too much money), paved over by the Trans Canada Highway. We drove to Placentia, a town dating back to the 1600's, near the ferry docks at Argentia. We wandered about the town. At the O'Reilly House Museum we learned about the Resettlement. Newfoundland was developed by cod fishing. There were hundreds of tiny fishing outports only connected by the sea. In 1949 the Government decided that to provide education, healthcare, and social services at less cost, the people would have to move to a small number of consolidated towns. Many homes were floated across the water or dragged on the ice in winter to new locations. 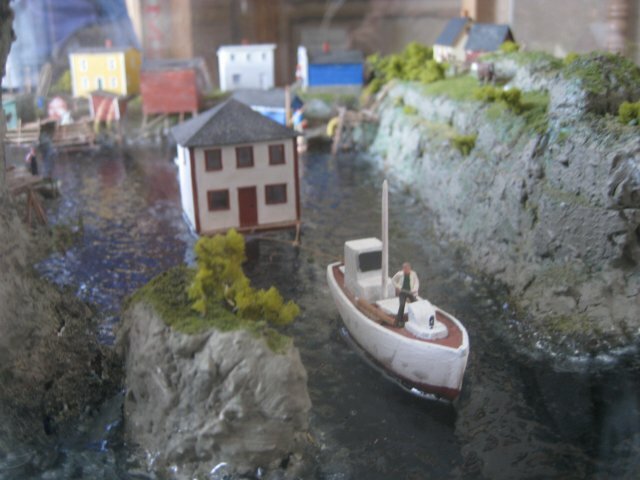 The museum had a nice model showing how this was done (see photo). If you saw the movie, the Shipping News, you may remember the house being dragged across the ice. They didn't make that idea up for the movie, it really happened. After the museum visit we had dinner at Belles Restaurant and had seafood platters. Our last meal in Newfoundland was a first with COD TONGUES (see next entry). They are quite good; sort of salty with a unique texture.